Does anyone know any actual children who enjoy gothic tales? I'll give you Lemony Snicket, but other than that, my very modern students aren't very interested in books that are nostalgically old-fashioned and hip at the same time. 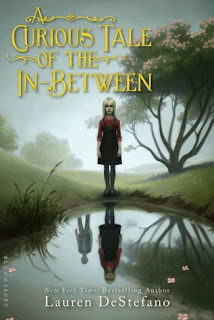 Still, A Curious Tale of the In-Between was a good read, which would probably be downgraded to a decent read if I hadn't been on a plane when I read it. It's the story of Pram Bellamy, a young girl who has the gift of seeing the dead. Her best friend is a dead boy and she doesn't have much use for the living, until she makes a living friend named Clarence. She offers to use her abilities to help him find his late mother, but it ends up being far more dangerous than they ever imagined. This is a pretty gloomy, atmospheric novel and, as I mentioned before, I don't know many middle grade readers who enjoy that type of book. It seems to be popular with adults who read children's books, so that may be the intended audience. Author Lauren DeStefano is talented, in spite of my roller coaster past with her books. This is a fairly wishy washy review, but that's how I felt about the novel. I wouldn't recommend it to children who have lost a parent, but if you have a reader who enjoyed Liesel & Po, then they just might like this as well.